Minos, the son of Europa and king of Crete, besieges Alcathous and the coast of Megara, and its king, Nisus, amid his grey hairs, has a gleaming purple tuft which holds the security of his kingdom. Now, his daughter, Scylla, climbs to the top of the tower of the king to watch the siege and falls madly in love with Minos. She convinces herself that if she is taken hostage, the war will end. With such thoughts, she sneaks into her father's bedroom, tears off his tuft, and hurries out to find Minos. King Minos, however is appalled at her present, and claiming her a disgrace, calls for her banishment. Imposing just wars on the Megarians, Minos set sail for home, leaving lovelorn Scylla spewing poison and lamenting her fate. 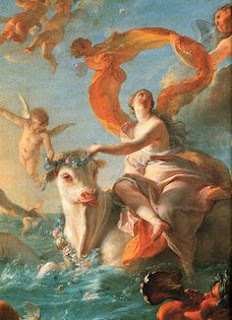 Finally, she decided to follow Minos, diving into the waves and holding fast to his ship. Yet, her father now is a tawny osprey, and he dives at her, dislodging her from the stern. Scylla transforms into a bird, called the Ciris, meaning to cut, for she had shorn her father's tuft. Minos arrives home and sacrifices to Jove, but there is a shame lurking in Crete. The adulterous liaison of Mino's mother and a bull, has produced an hideous offspring which must be concealed. Minos gets the famed builder, Daedelus, to construct a labyrinth that is so intricate, the monster will never get out. 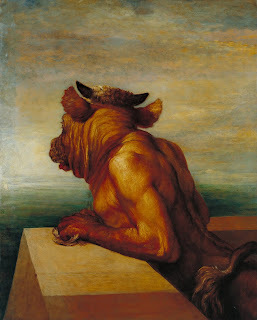 In this maze, the Minotaur is imprisoned, but Theseus kills it three years later, with the help of Ariadne, the daughter of Minos, who gives him a thread to find his way out. While Theseus took Ariadne with him, he left her on Naxos, but in her desolation and tears, Bacchus gave her a place in the constellations as the Northern Corona, her crown a diadem of stars. Daedalus, weary of his sojourn in Crete, decides to escape, and "at once he starts to work on unknown arts to alter nature". Constructing wings make of reeds, twine, feathers and wax, he cautions his son, Icarus, that he must follow him and not fly too high nor too low to avoid being wetted by the ocean or scorched by the sun. At first, the boy flies right behind his father but then, delight and audacity come upon him and he soars up into the open sky. The wax on the wings melt and he plunges to the sea and to his death. Daedalus finally discovers his son's plight and builds a tomb for him on an island now called Icaria. As Daedalus builds the tomb, an irate partridge comes out of a muddy ditch to scold him. This bird is Perdix, his nephew, who at twelve years old was trusted to his care and teaching. But the boy proved too clever and bright, and in his envy of the child, Daedalus threw him from Minerva's sacred citadel, lying and saying that he'd fallen. Minerva, however, scooped the child up in mid-air and transformed him into a partridge. Now Daedalus, spent and ragged, arrives as a suppliant near Aetna (Sicily) where King Cocalus gives him refuge but wisely prepares his troops for an invasion by Minos. 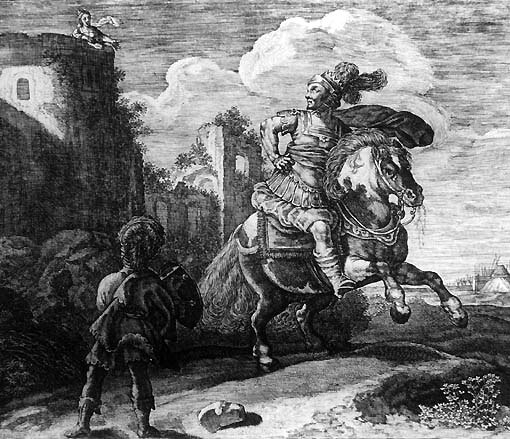 Because of Theseus' bravery and success, Athens is relieved of paying tribute to Crete and all lands praise him and ask for his assistance in peril. 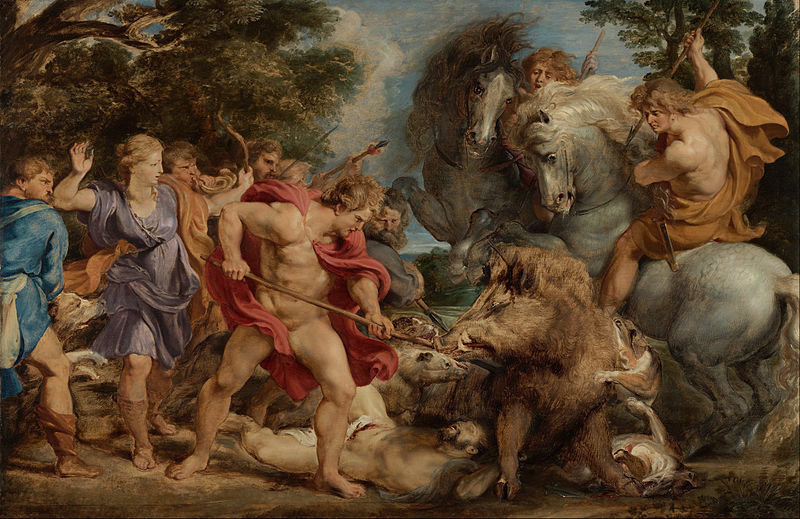 Oenus, king of Calydon requires his assistance when a massive boar is sent by the goddess Diana, who is incensed because all the gods had been given a gift of the harvest, yet her alter lay bare. A legion of men gather, some of whom are familiar, including Achilles' father (Peleus), Jason, Telamon, and wise Nestor in his youth (from The Iliad), and the Calydonian hunt begins. The men charge the boar who becomes enraged and nothing seems to be able to slow his frenzy. Finally, Atlanta, the only woman in the hunt, manages to draw blood, and Meleager praises her bravery. The rest of the men, however, are angered at being bested by a woman, and rather forcefully, yet thoughtlessly, attempt to kill the animal. Finally Meleager kills the massive beast, and all applaud him, but when he gives part of the his glory to Atlanta, dissent rumbles through the hunters. His uncles emerge to reclaim his gift, angering Meleager who kills them both. Theseus, sailing away from Calydon and the carnage, is warned by the river-god Achelous, to take refuge in his house. Heavy rains have swelled the Achelous river and he is in danger if he attempts to cross. 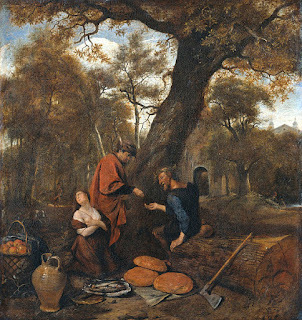 Aegus' son accepts the hospitality and he is given a feast. Pirithous, the son of Ixion, scoffed at the river god's tale, feeling that the gods were given too much power, but Lelex countermands his profession with a story to tell. In the Phrygian hills, there once was a devolted old couple named Baucis and Philemon. One day, the gods Jupiter and Mercury came seeking shelter in the guise of men. The poor doddering couple gave them lodging and the best of the food they had to offer. When they saw that their wine bowl was magically being replenished they were frightened that their food was not good enough and went to kill their only goose who guarded their land. But the poor goose gave them a chase and they gave up exhausted, when finally the gods revealed themselves. They took the couple on a long walk and when they looked back, their house was turned into a temple. When asked for their desire, they asked to become priests of the temple and die together when their time came. All came to fruition, but as their lives faded, one was transformed into an oak tree and the other, a linden. Theseus is quite stirred by these tales and wishes to hear another. Achelous tells of the transformations of Proteus, then relates a story of Erysichthon, who scorned the gods, chopping down a sacred grove of Ceres, including a sacred oak, causing the tree to bleed as the nymph inside is killed. She utters a prophesy of punishment for Erysichthon's sin, but still Erysichthon is heedless. 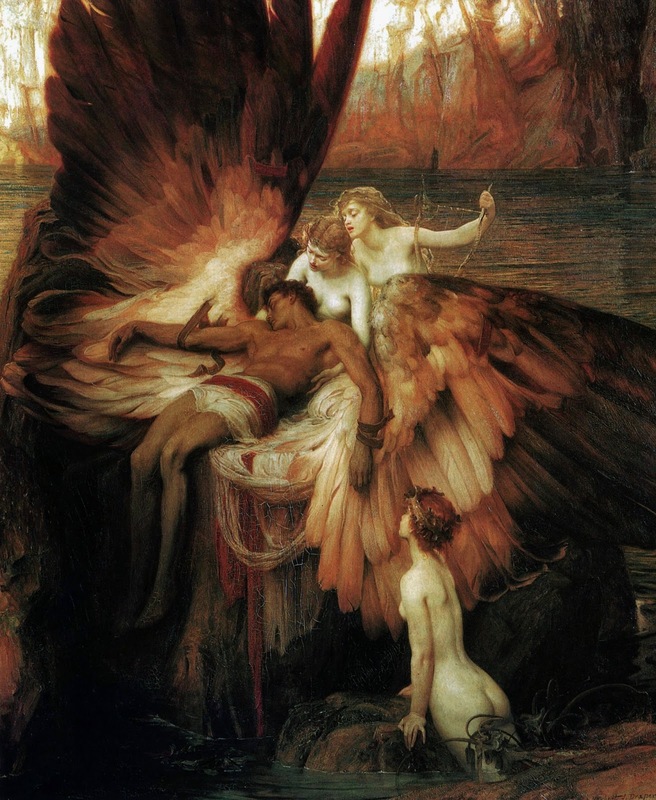 In punish for Erysichthon's heartless deed, Ceres sends her nymph to Famine (as she cannot go herself for their purposes are opposed), and Famine pays the sinner a visit, breathing on him until he dreams of gnawing, burning hunger, but he can only eat air. Erysichthon's hunger becomes so unbearable that he sells his daughter, but she escapes her master by changing herself into the shape of a man. When father sees daughter again, he sells her to master after master, all of whom she eludes by changing form. 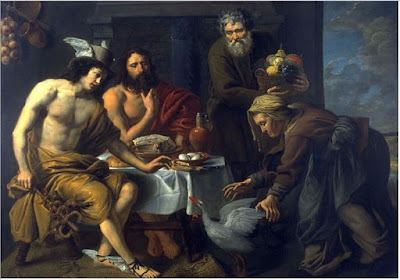 Finally, the ravenousness of Erysichthon causes him to eat all he has and, in desperation, he "began to rend his flesh, to bite his limbs, to feed on his own body." Erysichthon's daughter ❥ man, mare, bird, deer, etc. This conflict between a woman's family and her sons is becoming a recurrent theme...remember the absolutely gross, Philomena and Procris episode. Its like the woman has to chose between her married family and her blood family. I understand in a state of constant conflict especially in events like Peloponnesian Wars, various members of the same family may be on opposing sides; but in both cases, Ovid seems to think the woman has to avenge and put one side of the family over the other. Yes, I think you have something there ........ is there a theme of hierarchy? Scylla should have remained loyal to her father (and didn't), Icarus should have listened to his father (and didn't), Meleager kills his uncles (who should have held authority over him) and pays for his crime, Althaea is loyal to her brothers over her son, and then Ovid loses it at the end with a lovely story of hospitality and a warning to show respect for the gods. It's really hard to follow his train of thought, if there even is one. It's going to sound weird but as far as the flow of his writing goes (or lack of it), he reminds me a little of Montaigne, but without the charm.